Since 1997, 5 Star Auto Plaza has been proud to supply an extensive selection of reliable used vehicles and stellar customer service to thousands of car buying consumers throughout the St. Louis, Missouri area, from selecting the perfect auto to meet your specific needs, financing for any situation, routine maintenance work and repair when things go wrong. Our sales and service personnel continue to demonstrate a dedicated positive commitment to the people in the communities we serve. 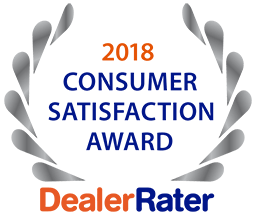 The team of knowledgeable and experienced professionals at 5 Star Auto Plaza is honored to have been presented the 2015 Consumer Satisfaction Award by DealerRater in recognition of being one of the top 10% of auto dealerships in the United States and Canada. This award demonstrates receipt of reviews of at least a 4 out 5 for client satisfaction from more than 40,000 dealers. On behalf of everyone at 5 Star Auto Plaza, we want to express our gratitude to the contented customers who took the time to rate their favorable car buying journey with us. It means a great deal to us that you took valuable time to share your great experience with others. We pledge to continue to supply exactly what you require in an auto dealership. To talk with one of our sales staff about our current inventory of trucks, autos, mini-vans and SUVs and special deals we are offering at this time, call 5 Star Auto Plaza at (636) 940-7600. 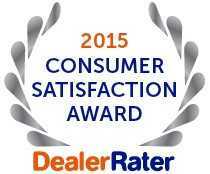 Trust your auto buying experience to a DealerRater certified business that has achieved the coveted 2015 Consumer Satisfaction Award. We look forward to serving you.